Thanks to improved manufacturing and distribution savings, Free Hot Water’s new line of OG-300 residential solar systems are now more affordable than ever. The lower prices are part of our ongoing campaign to bring affordable solar energy and utility independence to American homeowners. All of our 12 new OG-300 systems are easy-to-install closed loop systems, suitable for flat or titled roofs. Only glycol, piping, and flex hoses are additional, as these parts will vary from home to home and the systems chosen. 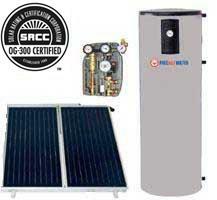 Veteran plumbers and contractors need only experienced training to add solar water heating to their list of services. Whether you’re new to solar hot water or a veteran installer, we welcome you to create an account to see our new reduced prices. We sincerely believe they’ll make a difference and inspire people to spread the word about solar hot water being more affordable, especially with state and local incentives. This entry was posted in Residential Solar Hot Water, Solar Business Resources, Solar Hot Water, Solar Hot Water Value, Solar Thermal Economics, Solar Thermal Training and tagged solar hot water incentives, solar hot water prices, Solar Thermal Training, solar water heating. Bookmark the permalink.